Starting location: Hone Quarry Recreation Area. From Dayton, VA, head west on Rt 257. Following signs for West 257, travel 11 miles. Shortly after entering George Washington National Forest, turn right onto FDR 62 into Hone Quarry Recreation Area. Go 1.5 miles, passing the picnic area and campground. Cross the low-water bridge and go 200 yards; turn left at brown "trail" signpost. Pull into this area and park. Description: From the parking area, look for the yellow-blazed trailhead to the upper right. This is the official trail, not the path you will see ascending over a dirt birm. Following the blazed trail, you will soon come to a trail intersection; the sign indicates Big Hollow Trail to the right, and Heartbreak Trail to the left. You can go either direction and loop back to this spot; we will go left on Heartbreak (435A). Follow blazed trail around the ridge above Hone Quarry Run and across a small stream (dry in summer). You will soon begin the true ascent up the ridge. As you climb, you will enjoy nice views to the north, particularly on a winter day. The view only improves as you continue up the mountain, eventually emerging onto Hone Quarry Mountain Trail. Turn to the right (west) and continue along the top of the ridge. There is not much relief in trail difficulty; it continues to dip and climb along the ridge as you make your way west. As your elevation increases, you will pass through pockets of dense mountain fetterbush (pieris floribunda) and stands of Virginia Pine. At 2.5 miles into the hike, you will come to Abbie Point Overlook; this is a nice resting spot as you appreciate the long vista expanse of Shenandoah Mountain to the west. From here, descend sharply to the right and through the saddle before climbing again 0.6 miles to a second summit and the intersection of Big Hollow Trail. Hone Quarry Mountain Trail continues straight ahead, eventually to the top of Shenandoah Mountain and FDR 85. You want to take Big Hollow Trail to the right. Descend 0.5 miles on this wide trail (fire road) before taking a left turn on the narrower trail. This turn is not clearly marked, but you will see a rock fire-ring in the middle of the trail ahead. Instead of walking toward this fire-ring, turn left on the yellow-blazed smaller trail to the left. (Note: this area was subject to a controlled burn in 2010; more about that below.) Continue on this narrow yellow-blazed trail (crossing a grassy fire road) 0.7 miles to the bottom of a ravine and a stream crossing. From here, walk on the old road bed, crossing the stream one more time, 0.8 miles back to the trailhead. A nice topo map can be found here. Why we like it: This is a more challenging loop hike and offers great views, especially when the leaves are off trees. The trails are well-marked and you will see a variety of plant life. We have spotted deer, rabbit, turkey, ruffed grouse, bear, and bobcat tracks along this trail, and kids will enjoy the views and playing at the creek crossings. At Abbie Point Overlook you can see many peaks along Shenandoah Mountain, including Dyers Knob, Reddish Knob, Bother Knob, and Flagpole Knob looking south to north. The trail is very accessible from Hone Quarry Recreation Area, yet it quickly feels wild and remote as you begin climbing the ridge. A campground and picnic area are located at the recreation area, and there are a couple primitive campsites along Hone Quarry Ridge Trail (but no water sources). 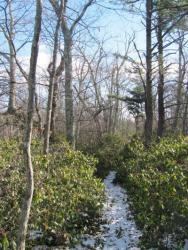 Streams may be high and difficult to cross in winter/early spring. The forest service conducted a controlled burn along Big Hollow Trail in the summer of 2010. Controlled burns clear underbrush and encourage new growth. Along the upper part of the trail, the burn was located to the north and down the side of the ridge; this is a good opportunity to note the difference in vegetation (due to the burn) on the north and south edges of the trail. The trails are fairly popular with mountain bikers and horse-back riders. Be alert to other users of the trail.